Address: 1052 Budapest, Pilvax köz 1-3. An elegant yet family-style 3-star hotel located in one of the quietest pedestrianized streets in the city, yet just a short stroll to the non-stop buzz of Váci Street plus the cultural and shopping centres of the downtown. The historical Pilvax restaurant and brasserie also operate from here. Our elegant and yet family style 3-star hotel is to be found in the very centre of the Budapest downtown although on a quiet pedestrian street. It is a two-minute walk from famous Váci Street and just a few hundred metres from cultural and shopping centres. 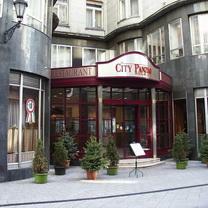 The Pilvax Restaurant and Brasserie, known and recognized throughout Hungary, is located in the building. During the summer we open a terrace onto Pilvax Walk. Guests can enjoy the finest of Hungarian and international cuisine accompanied by cimbalom music in the historical restaurant of the hotel in the heart of the Budapest downtown. During the summer peaceful, intimate terrace attracts guets wishing to dine by candlelight.Enjoy the spirit of the past! Whether for a press conference, wedding, meeting, product presentation, corporate event or conference, our rooms can be set up according to your requirements and fitted with the equipment and technical facilities you need. Pilvax restaurant master chefs create speciality dishes on the spot.